Reflowed tin is a process that results in improved solderability as opposed to standard electroplated tin. After a part has been electroplated with tin, the part is reheated above the melting point of the tin plating (greater than 450°F), then cooled. Tin reflowing reduces the internal stresses that arise during the electroplating process that have been thought to contribute to tin whisker formation. The reflow process improves the bond between the tin plating and the base material. Parts treated with reflowed tin exhibit excellent corrosion resistance. Reflowed tin provides a smooth attractive finish that is safe for food handling equipment. 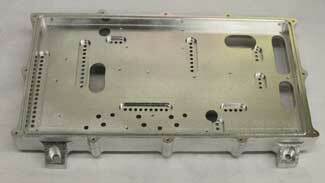 Reflowed tin plating provides good thickness uniformity and a glossy surface finish. Reflowed tin corrodes at a slower rate than regular tin plating. In the case of circuit board components, parts that have been reflowed also require less insertion force. Additionally, metallic strips or sheets that have been plated with tin and reflowed can later be stamped into complex part shapes because of the excellent formability and ductility of the tin. One of the major benefits of reflowed tin plating is that unlike solder plating, reflowed tin is lead free. As many industries are looking to remove lead from their products because of its health and environmental issues, reflowed tin is an attractive option. Reflowed tin is compliant with RoHS standards that govern the use of hazardous products in electronic products. Bright Tin deposits cannot be reflowed. There are very few companies capable of reflowing tin. Hi-Tech Plating & The Tinning Company is one of the few companies in the United States that can perform reflowed tin plating for your application. Hi-Tech Plating & The Tinning Company will work with you on your reflowed tin application. Put our expertise - and our top quality and service - to work for you today. Tin Pan Alley has two possible derivations. Both from the turn of the 20th century and both are from New York City. One story says that a columnist visiting studios that were concentrated in one building heard so many pianos playing at once that the cacophony sounded like tin pans being banged. The second story is similar in that in the area of New York that became the Flat Iron District, there were so many people playing out of tune pianos at one time that if you walked by or into an alley it sounded like tin pans being pounded. China & Indonesia are the World's largest producers of Tin. The U.S. no longer mines tin. Tin foil is made out of aluminum.